(Newser) – The Obama administration today finalized a major upgrade to America's fuel economy standards that will force new cars and trucks to average 54.5 miles a gallon by 2025. The final rules rolled out today are essentially the same ones proposed last year, the Detroit News reports, but they are no less impressive for all that, representing a doubling of the standards in place when Obama took office. 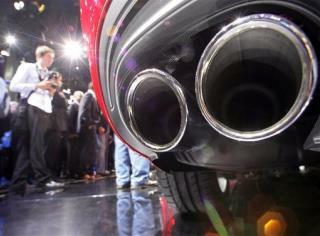 What's more, automakers are largely on board with the deal. The main question is how is this measurement going to be obtained? Current hybrid cars estimated mpg is calculated off from fuel usage only. Manufacturing, maintanence, an recycling/disposing of the batteries has a huge impact on the environment that is not calculated into mpg. the rule should be no petrol by 2020 for all commuter cars...can't make an electric ferrari ...but certainly hybrid to travel within city definitely ...what kind of morons are picked to choose our future is truly bewildering .....yet still an effort compared to those who would have coal cars if they could !! I could go with 54 MPG, but pushing it to 54.5 MPG is too far! For god's sake man they're only engineers, Jim.